LEASE A 2018 WRANGLER UNLIMITED SPORT 4X4 FOR $302 per month for 48 months. $2,999 total due at signing, no security deposit required. Tax, title and license extra. Offer expires on 1-2-2019. Low-mileage lease for well qualified lessees. Based on MSRP example of $34,940.00 with 24B package after all applicable offers. Total due at lease signing includes a down payment and first month’s payment. Offer requires dealer contribution. Tax, title & license extra. Lessee pays for excess wear and mileage of $.25/mile ($0.50/mile for SRT models) for each mile over 10,000 miles per year, if vehicle is returned at end of term. Option to buy at lease end at pre-negotiated price. Dealer’s actual terms may vary. Offer through Chrysler Capital. Residency restrictions apply. Must take retail delivery by 01/02/2019. $395 disposition fee due at lease end. 2018 JEEP WRANGLER RUBICON The All-New Wrangler Rubicon is off-road ready. With rugged 33-inch tires, an 84.1:1 crawl ratio and easily accessible switches for engaging 4×4 capabilities, the Rubicon is tailor-made for all kinds of boundary-breaking experiences.The 2-door model has late availability. 2018 JEEP WRANGLER SAHARA The All-New Wrangler Sahara has been designed to deliver a premium experience with superior materials and craftsmanship throughout. Inspired by Wrangler heritage, the Sahara features a refined cabin with state-of-the-art technology, innovative storage and exceptional comfort. On the exterior, its iconic look is accentuated with body-color fender flares and an available body-color hardtop. 2018 JEEP WRANGLER SPORT S You’ll find a noble spirit of freedom and adventure in the Sport S. It’s ready to take on trails but provides an upgrade on features over the Sport. 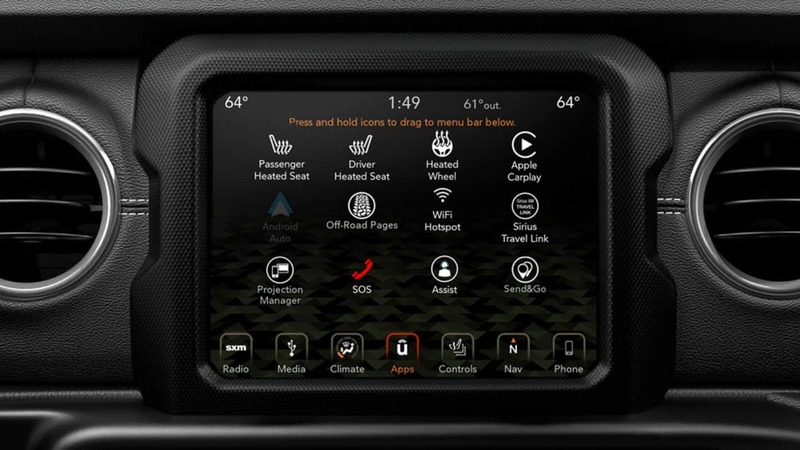 The All-New Wrangler Sport S boasts 17-inch aluminum wheels, a 3.6L Pentastar® V6 engine, the latest Uconnect® system with a 5-inch touchscreen and more. The 2-door model has late availability. 2018 JEEP WRANGLER SPORT The All-New Wrangler Sport is for those who want nothing to get in the way of their adventure. 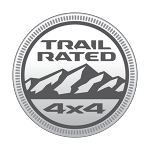 It features the Trail Rated® designation, signaling its ability to take on tough trails with confidence. 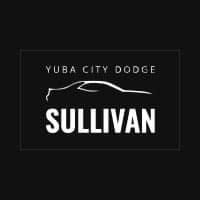 It’s authentic to the core and is ideal for those who are looking to customize and make it truly their own.The 2-door model has late availability. WIN THE BATTLE: True to its heritage, the 2018 Jeep­® Wrangler has the traction to handle some of the harshest, most unpredictable driving conditions. Transferring power to the ground efficiently is the key. The Wrangler is available with three different 4×4 systems, each designed to satisfy different applications. HANG TOUGH: Good suspension and axle articulation enhances your off-road performance by maximizing flexibility. Keeping your wheels on the ground longer for maximum traction while going over obstacles is the key. LIKE A GLOVE: Navigate tight spots and dodge unexpected hurdles thanks to precision steering and optimized wheelbases. The All-New Jeep® Wrangler has been engineered with a tight turning radius to manage challenging situations. 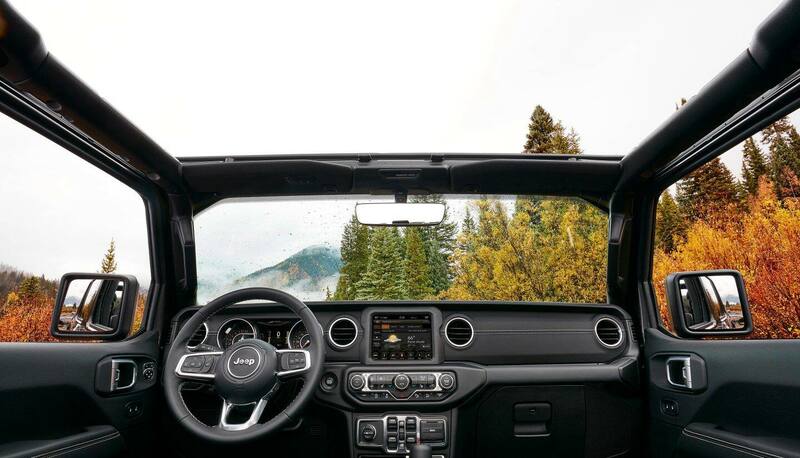 CLEAR THE PATH: The All-New 2018 Jeep® Wrangler is built and tested for driving over obstacles such as logs, rocks, or whatever else happens to be on the trail. From ground clearance to approach, breakover and departure angles, this legendary vehicle just keeps on going. TAKE A DIP: Small creeks, streams and deep rainstorm puddles can be crossed without a worry. The 2018 Jeep® Wrangler is designed with its air intake positioned high in the engine compartment, electrical connections are sealed against moisture and body openings close tightly, keeping the water out until you’re back on dry land. GET IN AND GO: The Selec-Trac® 4×4 System features a full-time mode that will automatically switch from 2WD to 4WD when conditions dictate. Relying on internal wheel speed and traction control sensors, Selec-Trac makes driving in uneven terrains and inclement weather safer and smoother while delivering superior efficiency when four-wheel drive isn’t needed. POWER UP: When four-wheel power is required, the Command-Trac® 4×4 System with an NV241 GII transfer case shifts into action to help you get through with ease. Command-Trac is a proven shift-on-the-fly system with a 2.72:1 low range for rock crawling and neutral for available flat towing—purposefully built for fun and the freedom to go wherever the adventure leads. OUR STRONGEST GRIP: Any off-road enthusiast knows the legendary Rock-Trac® 4×4 System. Standard on the Rubicon, it gives you more control and more torque, offering superior off-road performance. Want even more jaw-dropping capability? The tough-as-nails NV241-Off-Road transfer case with a 4:1 low gear ratio, Tru-Lok® electronic locking front and rear differentials and an electronic front sway bar disconnect are always ready to be tested. TAKE THE EASY WAY DOWN: With available Hill Descent Control engaged, your Wrangler will control your speed as you go downhill over rough terrain. 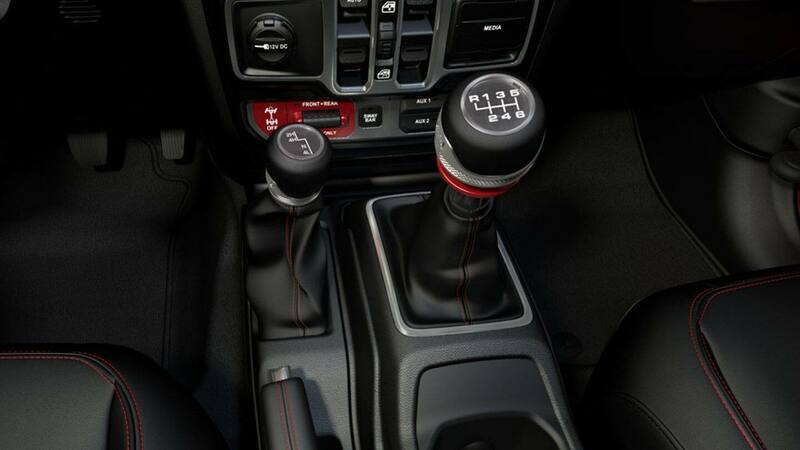 You can concentrate on steering without the need to ride the brakes. The All-New Jeep® Wrangler might look familiar, but take a closer look and you’ll see upgrades and smart improvements at every turn. Like those who instinctively explore what’s possible, the Wrangler is never satisfied with standing still. The Wrangler is an extension of who you are. It is rugged, capable and versatile, built to be there for every expedition you plan. On- or off-road, doors on or off– the only limits are bound by your imagination. The new available Trail Rail™ System is a premium, adjustable rail-based tie-down utility system that mounts on the cargo floor and swing gate. Customize it with accessories from Jeep® Performance Parts. The new available Jeep­­® Utility Grid was inspired by MOLLE-style tactical packs used by armed forces worldwide. It acts as an organizer and flexible storage system. Store a flashlight, first aid kit or water bottles for easy access when needed. The rear storage area features a removable cargo floor designed to keep your gear hidden from view. The glove box and center console are both lockable to provide an extra layer of protection—helping to keep your items secure even with the top down. Grab handles are built right into both the A-pillar and B-pillar to make it easier to get in and out of the Wrangler and to offer solid support when off-roading. The All-New 2018 Wrangler can be started with the push of a button. The button is waterproof, having survived a 24-hour soak test in a mist chamber. 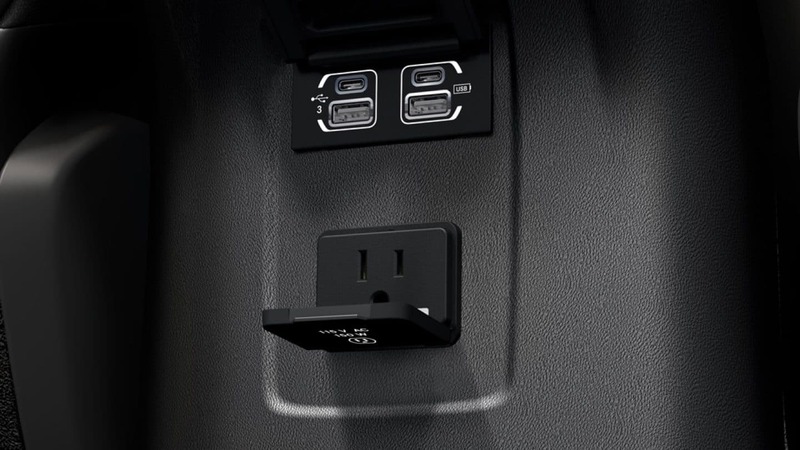 With an available 115-volt auxiliary power outlet, you can easily power up mobile phones, electronics and more without using an adapter. Knobs, buttons and toggles have all been tested for supreme function. Rubber material around the Uconnect® touchscreen, Start/Stop button and switches is purposefully designed for usability, ergonomics and added durability. 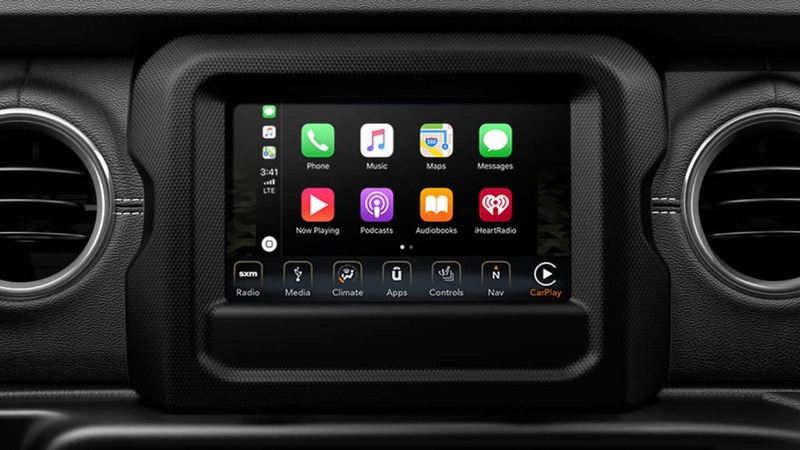 This available system features an 8.4-inch pinch-to-zoom touchscreen, Navigation with turn-by-turn directions, Apple CarPlay® support and Android Auto™, SiriusXM® Traffic, SiriusXM Travel Link and more. This available system features a 7-inch pinch-to-zoom touchscreen, Apple CarPlay® support and Android Auto™, SiriusXM® Satellite Radio and more. This standard system features a 5-inch pinch-to-zoom touchscreen, Siri®, Bluetooth® Streaming Audio, SiriusXM® Satellite Radio and more. The available custom-configurable 7-inch Multiview Driver Information Digital Cluster Display lets you tailor your personal settings and graphics. 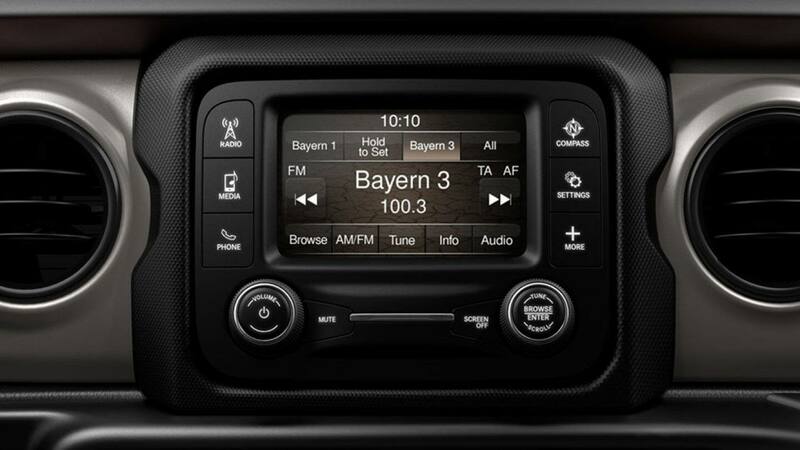 The full-color display integrates detailed Navigation (if equipped), features media information such as song, artist and station, displays real-time transfer case status and off-road statistics and more. BREAK THE SOUND BARRIER The All-New Wrangler offers an available Alpine® Premium Audio System with a 552-watt 12-channel amplifier, eight speakers and a rear subwoofer. The system is enhanced by active noise cancellation and acoustic laminated windshield glass. The All-New 2018 Jeep® Wrangler is equipped with the latest state-of-the-art active safety features to that keep you aware of your surroundings, as well as time-tested passive safety systems that will bolster your protection when necessary. Both Blind Spot Monitoring (BSM) and Rear Cross Path Detection (RCPD) rely on radar-based sensors to detect other vehicles. BSM will alert you if another vehicle is traveling in your blind spot, while RCPD will warn you of vehicles crossing your path when you’re backing up. The new sport bar is constructed of ultra-high strength steel formed into a tough, rugged unitized component, painted body-color to blend with the rest of the body. Great for off-roading and steep urban streets, Hill Start Assist helps prevent your 2018 Jeep® Wrangler from rolling backward when starting on an uphill slope. Getting your vehicle in and out of parking spaces can be challenging. The Wrangler is available with three systems designed to help make it safer and more secure. Whether backing up to a campsite, a boat launch or a parking spot, the ParkView® Rear Back Up Camera combined with the Uconnect® touchscreen will make it easier.